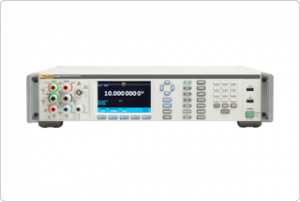 Fluke Calibration announced its 8588A digitizing reference multimeter designed for use in calibration standards laboratories. This digitizing reference multimeter delivers one-year DC voltage accuracy, and provides a stable 8.5 digits reading in a one second. It features more than 12 functions, accessible via the intuitive user interface and color display. The configuration menu makes it easy to train new users. A graphical display allows easy visualization of trends, histograms, complex waveforms, and statistics. Repeatable system-specific tasks can be automated quickly and easily. The 8588A works with Fluke Calibration MET/CAL™ Calibration Software that documents calibration procedures, processes and results for complying with ISO 17025 and similar quality standards.